This iconic image has been termed, like all the watercolors for The Birds of America in aggregate, a national treasure. It represents one of the four species of flamingos native to the Americas. 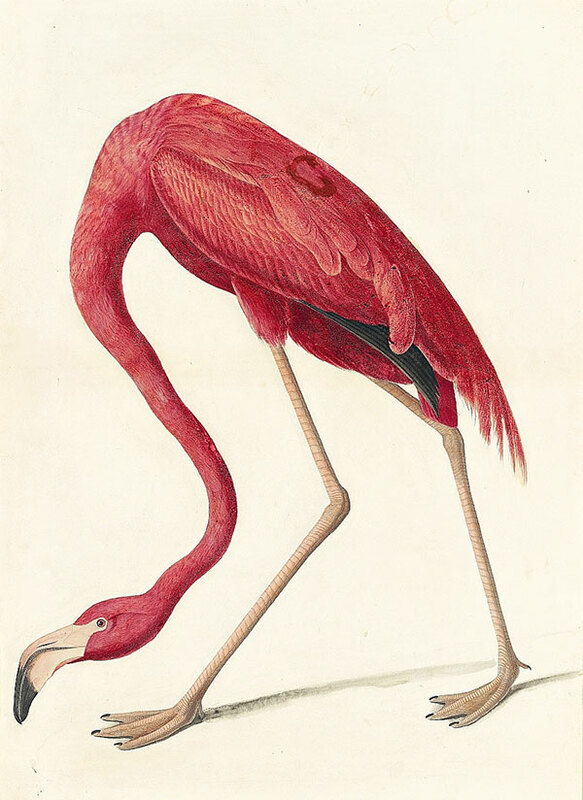 After spotting several flocks of flamingos in the Florida Keys in 1832, Audubon was keen to obtain a specimen. Unsuccessful, he wrote several times from London to the Reverend John Bachman in Charleston, South Carolina, impatiently requesting one. He finally obtained specimens from Cuba—some that were dried and two preserved in spirits. His use of specimens as models for this watercolor can be seen in the stiff-looking wing that stands outside the body plumage and contrasts with the one almost hidden by the ornamental scapular feathers and the black primaries. JJA manipulated the pose of this large bird to fit into the confines of the double-elephant-size paper. Condensing the bird’s physical characteristics, he seems to have captured all of its potential postures and movements in a single pose, like one frame of a movie that magically suggests the entire film. While many of Audubon’s ornithological predecessors were mesmerized by this exotic species, which suggests that anything is possible in America, only two of them had selected a similar posture, in which the bird bends over to feed, care for its young, and walk. But only Audubon made the bird appear to move. He successfully conveys its forward motion, seemingly about to stride beyond the left border of the page, an illusion he may have learned from studying paintings of the Baroque period. Pentimenti near the flamingo’s left foot demonstrate that he contemplated placing it in an even more forward position. To create this amazing image Audubon applied watercolor in the traditional manner, in layers of thin washes of color, which appear under magnification as overlapping tidal edges; he sometimes added gouache and pastel (in the legs). At other times, however, he mixed his pigment with glaze for denser, more sensuous effects and applied pigment with smaller strokes to create surface texture and the illusion of volume. 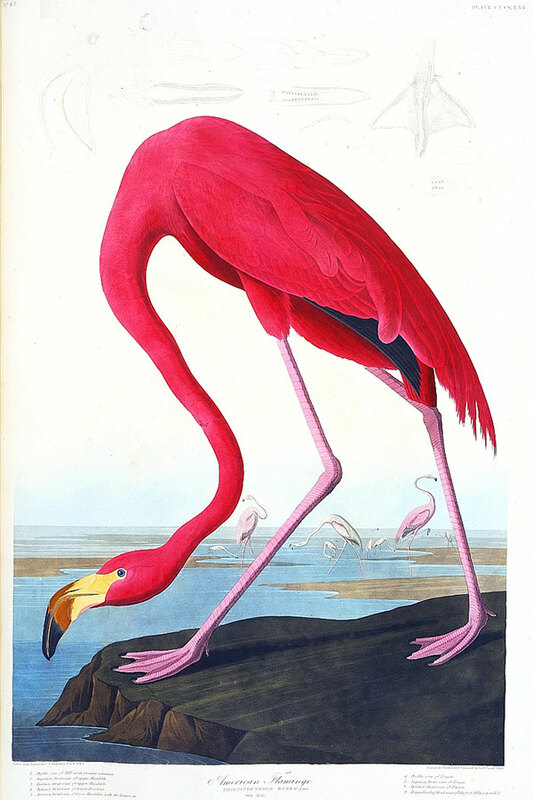 To render the brilliant pinks that flamingos acquire from the carotenoid proteins in their diet of plankton, Audubon built up many layers of media and glazing, a technique more common with oil pigment. This technique has caused the paint to crack over time. In the engraving of plate 431 for The Birds of America Havell, on Audubon’s instructions, inserted a background with other flamingos as well as detailed anatomical studies of feet to display their supple webbing for wading (Figure 1).